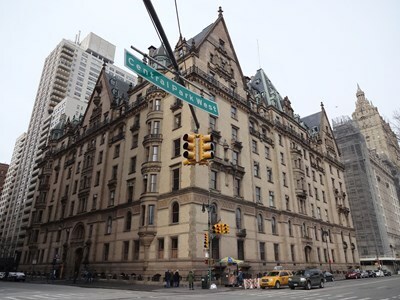 The Dakota, constructed from October 25, 1880 to October 27, 1884, is a co-op apartment building located on the northwest corner of 72nd Street and Central Park West in the Upper West Side of Manhattan in New York City, at 1 West 72nd Street, New York, NY 10023. The building is widely known as the location of the murder of musician John Lennon. The architectural firm of Henry Janeway Hardenbergh was commissioned to create the design for Edward Clark, head of the Singer Sewing Machine Company. This description uses material from the Wikipedia article on The Dakota and is licensed under the Creative Commons Attribution-ShareAlike License (view authors).